In early July we reported on YouTube channel MrBean35000vr demonstrating that it had hacked a Wii U and Mario Kart 8, showing changes to text within the game, the console's menu and WaraWara Plaza. 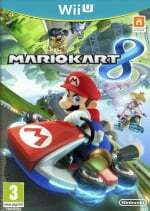 The hackers made a point in expressing their opposition to 'cheaters' and stated it was working towards being able to producing future content such as custom tracks and songs; the same channel did similar things with Mario Kart Wii. 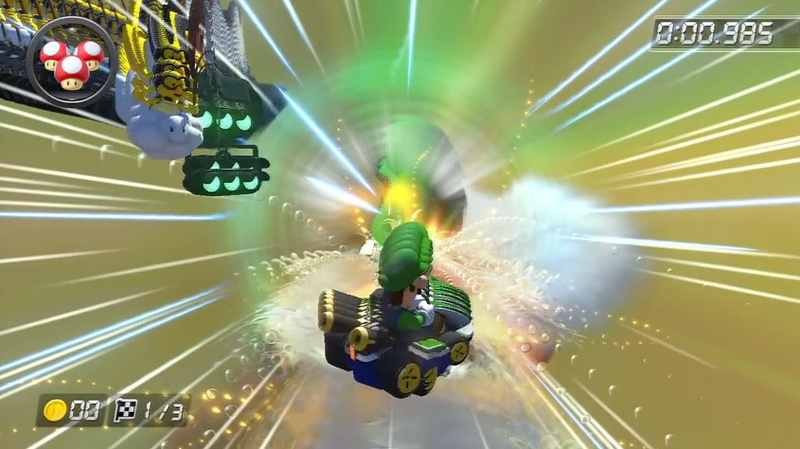 In recent times the channel has been posting more videos, showing its progress in modding Mario Kart 8. They're further evidence of the fact that the hacking duo do indeed have access to the code of MK8, changing it in various ways. In this first video ghost data from the N64 Rainbow Road track is played in the new Rainbow Road, so as a result Luigi drives around the surrounding area of the new course. This next example shows what the duo call an 'unused track', as its code categorises it as a square course. It's a little odd, in that it has no background and produces ghosting and fairly dramatic motion blur effects. The third video shows the effect when gravity is influenced; at first gravity is applied where it shouldn't be, and then there are attempts to drive through an anti-gravity section on normal wheels. Finally, this video shows texture changes in Thwomp Ruins, with ice and snow applied in place of the original design. The duo states that this final video shows that it's getting closer to the stage where it can recreate its own custom tracks in MK8, though it still seems highly doubtful that this will have a significant impact on the majority of gamers. The browser-based exploit being used for this Wii U hack was already shut down in previous system updates, so it's outdated firmware that's more than likely limited to offline only. It represents a landmark in terms of the system being hacked, but arguably in a way that shouldn't be particularly detrimental or damaging to Nintendo; the company would no doubt prefer it hadn't happened, of course. In some senses these videos give an interesting insight into the underlying code and how Mario Kart 8 works, though the moral justifications are obviously up for debate. Let us know your thoughts, and as always with these topics please stick to the Community Rules. Glad the exploit is fixed. This looks pretty cool. Especially the hack for Thwomp Ruins. Normally not the biggest fan of hacks and all that s***, but stuff like this is pretty interesting imo. The "proof of concept" stuff like changing/dynamic weather effects and altering gravity are very cool. Nintendo gives so many options in SSBM and SSBB it would be nice if we had the ability to alter some of its other games. Day/night, weather, reverse course, items - how crazed would a race be if EVERY item was a blue shell!?!!? Or a bullet bill? I'm ok w/ limiting it too offline play, like SSB is going to be w/ the amiibo and Mii fighters it seems like. These kind of hacks i don't mind. Thwomp ruins looks beautiful as does Rainbow road Had to laugh but impressed they managed to complete a time trial not using the anti-gravity on those tracks! watching that second video on mute is a work of art. I made a GIF of that third video. I wouldn't go as far to say that texture hack is stunning...It looks out of place. This is how hacking should be done if it is to be done at all, I feel. Showing off parts of the game we couldn't otherwise see and customization. So long as it is not on online play, it is pretty cool. Although I admit, if I was to play online and suddenly be in Ice Thwomp Ruins one time, I wouldn't mind. Stay offline, don't give the hacks to the public, and we're all good. I like it when hackers find stuff that was dummied out (The Cutting Room Floor has a huge database dedicated to stuff like that), since it sometimes shows interesting concepts and ideas - or it's just plain funny. However, I still don't trust these guys. They seem to be legit hackers, but I'm carefully waiting for them to finalize their 'plans' of releasing modded content - if it actually threatens the WiiU's security, they're no better than Waninkoko (and that's saying something). Man, dat Thwomp Ruins looks so cool, I really wish they would have textures like that for DLC! This is what hacking should be about, finding these fun little unintentional easter eggs, not opening up a game to the public in order to undermine the company and devalue their IP. @Takerkaneanite6 No I want these people to be shutdown. Property isn't there's to mod. @ModestFan93 Not even texture hacks that only shows up on the screen of the hacker??? I tend to distrust most hacks, but I have to say it is interesting to see what else is hidden within the game. @AddADashOfSalt @Prof_Clayton I agree with both of you but his whole goal is to have custom tracks for online play, as the article already highlights this isn't possible on current firmware anyway so right now all this is experimentation with what is possible. So far it looks like they've just commented out some code lines, e.g. for gravity or textures. The ruins track just looks blank, not snowy. But it will be interesting to see what they can come up with! Personally I'm not much interested about all those mods. The game is great as Nintendo gave it to us. Oh baby i cant wait for these custom tracks! The ones on wii were actually really fun. @ModestFan93 they aren't doing anything illegal. I doubt that there won't be any attempts by this duo to make money from these hacks - it takes hours of work & a massive amounts of trial and error to work out the code in this way. Stating that it's being done all for fans is the best way of avoiding lawsuits. While they're not doing anything illegal (other than breaching the terms of sale which state you're not allowed to attempt to reverse engineer or alter the code), I reserve my judgement on the good nature of the hackers. @Kaze_Memaryu Ugh, Waninkoko. Yeah, let's hope these guys aren't of the same cloth as him. Everyones going like that and not trusting. They wouldnt do something damaging. People need to see their contributions to MKW hacking, and it wasn't anything to promote illegal or hacking/cheating online to ruin the fun. Did anyone else notice the coin count going crazy on the first video? Ghost Luigi gets 99 coins at one point. It is necessary for hackers and modders to exist, if the gaming medium is to be more democratic than autocratic. It always amazes me what some people can do for free, when the "experts" won't do it for a fee. Why buy new games when you can improve and mod your old favorites? The legal field is always so behind the times, headed by people who rarely ever understand the ramifications of modern technological boundaries, that I have a difficult time pinning them as a definitive source of guidance. I am also wary of issues like the Trans Pacific Partnership (which the US government elites are trying to fast track), which proves that large corporations will extend and exert greater control over the populace if they can. I'm ready for Nintendo to patch this stuff and get it over with, and i especially hope this doesn't go public. For this specific issue, it's really Nintendo's responsibility to maintain their own security measures. It's of no concern to hackers and modders if Nintendo cannot safeguard their own product. Lol at the second video. Poor Weegee totally tripping!